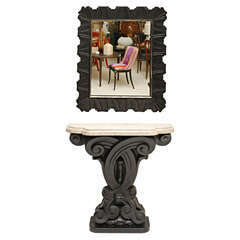 A chic and stylish altar style console table completely veneered in deep green marble. The details to the underside of the top are cast and patinated bronze. 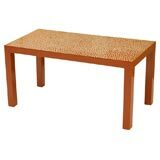 Table has style to spare and would work well in both a contemporary or traditional interior. There is the remnant of a gold foil Maitland-Smith label affixed to the underside of the table as well as what appears to be a group of numbers (model#?) as well. This table is in overall fine condition, no evidence of repair or replacement of stone or otherwise. Very stable. 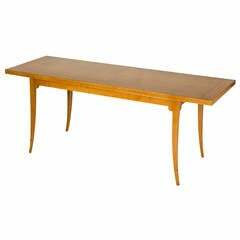 Gorgeous Parsons-style tables in a fine eggshell lacquer finish, after the manner of Jean Dunand. We have two available - each identical, and priced individually. 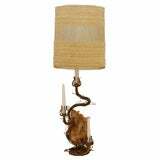 Unusual bronze and rock crystal table lamp designed by Tony Duquette with original Maria Kipp shade of woven chenille, wool, and lurex- circa 1950. Demilune console table in tessellated horn with brass inlays by Maitland-Smith. Recently re-polished. Mid-Century Modern brass inlay single pedestal tessellated console sofa table. Dramatic console table by Maitland Smith. The top is shagreen, the tusk like legs are tessellated stone. Signed with brass tag on verso of top.